You are going to want to save this caramel roll pull-aparts recipe. It’s excellent to make ahead of time and serve when company is over. These pull-aparts are made with frozen bread dough and topped with an ooey gooey caramel sauce. Hello! I’m so glad you stopped by. Today I have the ultimate breakfast bread recipe to share with you — caramel roll pull-aparts. These pull-aparts are excellent to make ahead of time and serve when you have company. You can even make and freeze several ahead of time for large gatherings. And with the holidays coming up, you will want to save this recipe! If one of our family get-togethers includes breakfast, you can bet we’ll have a batch of these pull-aparts ready to go. Along with my Mom’s tea ring, (a divine cinnamon roll ring with maple frosting) which I have yet to share. It almost feels too sacred but at the same time too good not to share. We’ll see! We call this type of bread “pull-aparts,” but you may be more familiar with monkey bread. Side note — I also found out in college that most people say sloppy joes instead of our family term “slush burgers.” And apparently, it’s really weird to call them slush burgers. Haha. Have you heard this before? Fill me in in the comments! 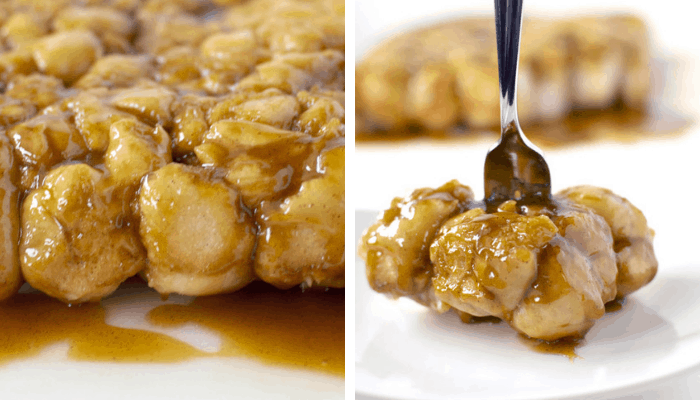 These pull-aparts are made with frozen bread dough and topped with an ooey gooey caramel sauce. I want to make a few notes on the ingredients. The Rhodes frozen bread dough comes in an orange bag. And can be found in the freezer aisle of the grocery store. In a bag of three. You can’t miss it. You need to use margarine instead of butter. Otherwise, you may not end up with a smooth caramel sauce. Make sure to use cook and serve vanilla pudding 4.6oz instead of instant pudding. This is a really important one. I’ve made this mistake before and it’s not pretty. The caramel turns out almost rubbery. Preheat your oven to 350 degrees. Then prepare a 9 by 13 pan by lightly greasing it with cooking spray. Mix all the ingredients for the sauce together in a medium-sized bowl. This includes the melted margarine, brown sugar, vanilla pudding, milk, and ground cinnamon. Next, take one loaf of bread dough and tear it into small chunks in the greased 9 by 13 pan. Pour the caramel mixture over the first loaf of frozen bread dough. Next, tear the second loaf of bread dough into chunks and place on top of the caramel mixture. Allow the bread dough to rise until it doubles in size. Bake for 20 minutes at 350 degrees. The top of the bread will be golden brown. You can also check by pulling up on a few of the pieces of bread (from the middle). Make sure it looks baked and not doughy. Finally, place a cutting board or cookie sheet over the 9 by 13 pan. 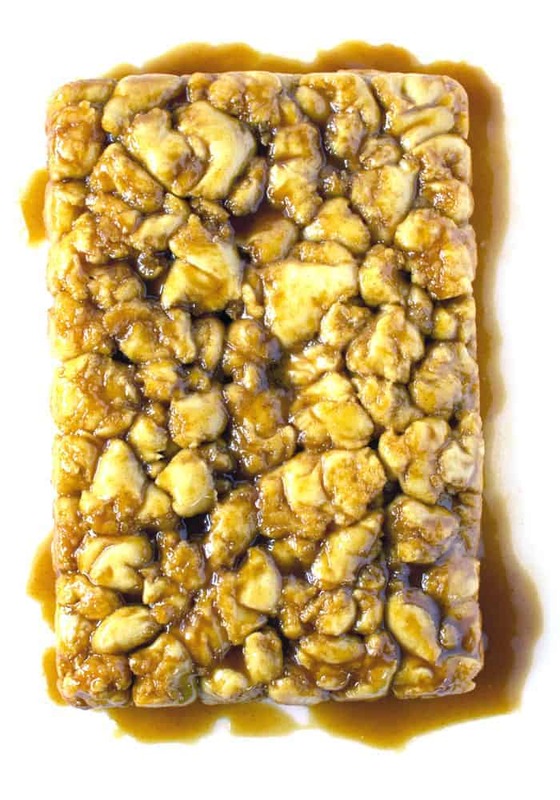 Flip the pan over to release the caramel roll pull-aparts. If you plan to store or freeze the rolls right away, you can add them directly to a storage container. But I recommend serving these caramel roll pull-aparts warm, if at all possible. They are ooey gooey and delicious right out of the oven. You can also serve with butter, but not necessary at all. Stop by and say hi in the comment! Let me know what you think of this recipe! 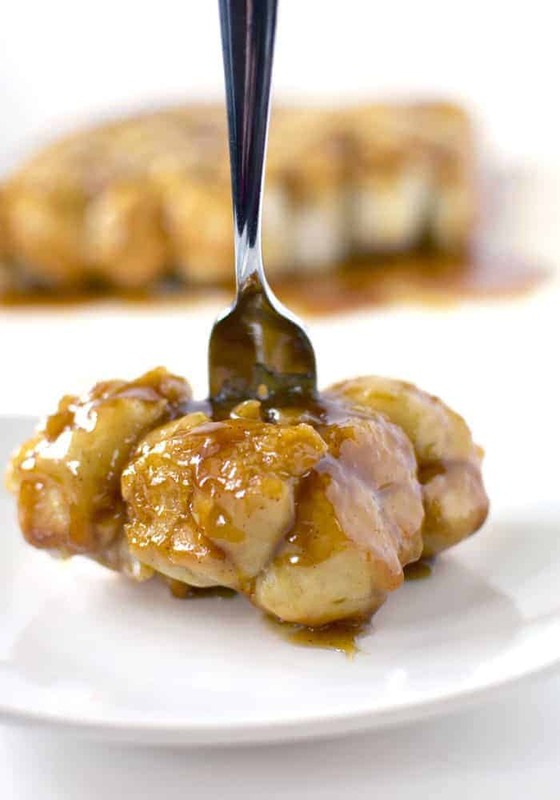 Caramel roll pull-aparts are made with frozen bread dough and topped with an ooey gooey caramel sauce. Excellent to make ahead of time and serve when you have company. And perfect for the holidays! Prepare a 9 by 13 pan by lightly greasing with cooking spray. Mix all the ingredients for your sauce, melted margarine, brown sugar, vanilla pudding, milk, and ground cinnamon. Take one loaf of bread dough and tear into small chunks in the 9 by 13 pan. The bread should be golden brown. 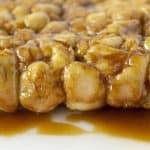 Finally, place a cutting board or sheet pan over the 9 by 13 pan and flip the pan over to release the caramel roll pull-aparts. Serve these pull-aparts warm — so good! Be sure to use margarine, not butter! Cook and serve vanilla pudding, not instant! For best results, make sure you are using fresh brown sugar. Not hard and clumpy brown sugar.